The Grand Finals of the Smite World Championships kicks off at 2:30 PM Eastern time today, as a U.S. team expected to be knocked out by its sister squad and a European open invitational underdog that made it to the competition by the skin of their teeth battle for a $1.3 million grand prize. Hi-Rez Studios' third-person answer to the MOBA has been around for a couple of years now, but this is the first year of official competition. 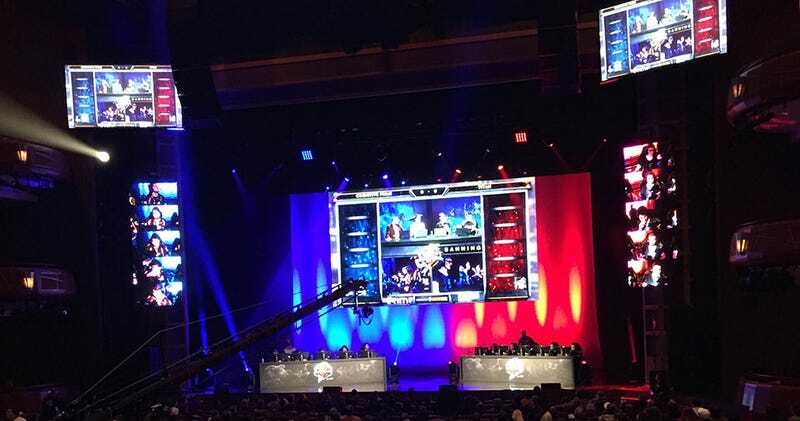 Thanks to an extensive community crowdfunding campaign the prize pool for the first Smite World Championship exceeds $2.6 million dollars, the third largest pool in eSports history. U.S. team Cognitive Prime were expected to lose to their young offshoot, Cognitive Red. The younger team took first place in every LAN competition they participated in this year, on through the North American Championship late last year, where they soundly thrashed Cognitive Prime. But the Cognitive Red that performed so spectacularly during the road to the World Championships didn't show up to yesterday's semi-final against Cog Prime here at the Cobb Energy Performing Arts Center in Atlanta, Georgia. Perhaps the younger team (Cog Red's youngest member is only 15 years old) couldn't handle the extended pressure — they seemed pretty exhausted by the end of the evening. While they took the first of three rounds, Cognitive Prime wiped the floor with them twice in a row to secure a spot in the grand finals. At the time of this writing Cognitive Red had just won the Consolation Match against SK Gaming to secure the third place prize of $391,839. Meanwhile, Cognitive Prime advanced to today's Grand Final. Here's a shot of the U.S. based team. There are actually five people on the team, but this guy — Barraccudda, aka 24-year-old John Salter. He's the man, even though some of the most impressive moments from last night's semi-finals were pulled off by Brett "MLCST3ALTH" Felley. Felley would pull off a triple kill with the terrifying Scylla (part little girl, part gigantic squid thing), and then the crowd would chant "BARRACCUUDDA!" Meanwhile, Barraccudda himself was using his chat headset to order pizza or something. It's a wonderful team dynamic. Cognitive Prime will be facing off against Europe's Titan, a team that entered the European Pro Tour through an open invitational and just made it through the European Regional Championship by the skin of their teeth. They were moments away from losing, only to rally at the last possible moment. The Titan in their base was a sliver of health away from dying, and they used European Black Magic to survive. Now the artists formerly known as Aquila are about to play a best-of-five match of Smite for a chance at $1.3 million dollars. Even if they lose they're still splitting Even if they lose they're still splitting $522,452 five ways. Not bad for a team who'd never played a LAN before the EU Championship. Two teams, neither of which were favored to make it here, in a knock-down, drag—out battle with more than a million dollars up for grabs. I can think of less exciting ways to spend a Sunday afternoon. Let's watch.